Temple Lodge No. 33 Regrets To Inform You That R.W.B. Bob Crawford Passed Away This Morning – Temple Lodge, No.33, Duncan, B.C. We regret to inform you that R.W.B. Bob Crawford Passed to the Grand Lodge Above this morning at home after a short but courageous battle with cancer. 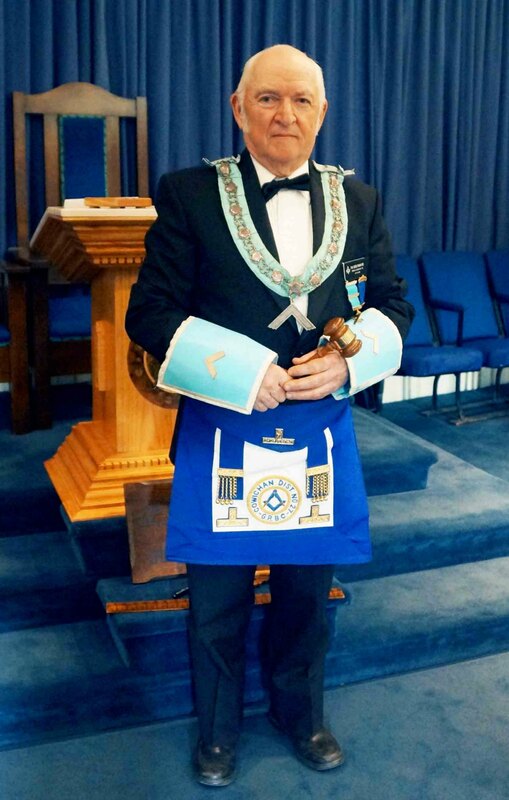 Bob Crawford was a very valued and highly regarded member of Temple Lodge No. 33 and he will be greatly missed by all of us. Temple Lodge No. 33 extends condolences to Bob’s family. Temple Lodge No. 33 will post details of funeral services for R.W. Brother Crawford in the near future. So sorry to hear of Bob’s passing. Condolences to Anne and the family. He was such a nice man. Thanks for your comments Susan. We will pass them along to Ann and the family. Thanks for your comments Lynn and Bob. We will pass your condolences along to Ann and the family. The Cowichan Valley has lost a man who was dedicated to family and community, who was an excellent paramedic, a “small acreage farmer”, who liked a “Lucky” at the end of a long hot day. Goodbye my friend…many will miss you. Raise a “Lucky” in memory of Bob. My condolences, to your lodge on losing your brother. May he be at peace now, and may you brethren, find solace in this time of sadness. My journey’s end has come. A new guide, now lead us on. Another mark, will be reached. To an even brighter day. We will pass them along to Ann and the Crawford family. So sorry to hear of Bob’s passing. My condolences to the family. He was a lovely man. I always enjoyed his company. Thanks for your comments Dedie. We will your condolences along to Ann and the family. He truly lived respected and his passing is well regretted. Bob would frequently pass on larger turkeys to “special” customers. LOL. Thanks for your kind comments. We will pass them along to Ann and the family. Richard and Shauneen, thanks for your comments. As you say, Bob Crawford was a good man. WE will pass along you condolences to Ann and the family. Bob was a great man and would always volunteer his time at the Cobble Hill Fair, when needed. Bob we will all miss you with saddened hearts. Our greatest condolences to Ann and family. From the Shawinigan Cobble Hill Farmers Institute We all know, Bob’s heart was well embedded in the farming community in the Cowichan Valley. George, thanks for your comments. As you say, Bob was very much involved in the local farming community. He will be missed. We will pass along your condolences to Ann and the family. Hi Ann. It’s Craig Lidston, as you know I worked with Bob at station 52 a number of times. I’m very sorry for your loss. He was a good man and fun to work with. We just heard about your loss in the Citizen. I wish I had been able to attend his service but I was out of town. Once again I am sorry for your loss.